"A Charming Past. A Soaring Future"
The Long-Smith Cottage was built around 1837 on Jane Long's property and later moved to its current site. The John M. Moore Home was built in 1883 and remodeled in 1905. It is now a museum. The McNabb House was built by Phillip Vogel in the 1850s and bought by A. D. McNabb in the 1880s. The McFarlane House belongs to the Fort Bend Museum. According to the United States Census Bureau, the city of Richmond has a total area of 4.3 square miles (11.1 km2), of which 3.9 square miles (10.2 km2) are land and 0.35 square miles (0.9 km2), or 8.22%, is covered by water. In 2003, Jeannie Kever of the Houston Chronicle said, "Some of the old buildings have been reincarnated as shops or law offices. But in other ways, life in Richmond isn't so different from that in the big city, with its Wal-Mart and fast-food joints, check-cashing businesses and strip-center sprawl." As of 2006[update] several strip malls are along U.S. Route 59 south of town. During the same year, the community included tack stores, two-lane blacktop roads, and horse ranches. John P. Lopez of the Houston Chronicle said, "Richmond is a city of contradiction and transition. It's as if the place is not sure if it wants to be a part of Houston's bustle or remain a slow-paced farm and ranch town. It tries to be both," and, "It is part Acres Homes, part Fort Bend County Fair." The wealthiest neighborhood, as of 2003, in Richmond is Hillcrest. Winston Terrace, another neighborhood, had its first houses built in 1940. Construction increased around the end of World War II. Most of the houses were built between 1940 and 1965. Jeannie Kever of the Houston Chronicle said that Winston Terrace is "a swath of mid-20th-century America, with sweeping oak trees and colorful brick or wood bungalows, named for the descendants of one of the region's most illustrious pioneers." "Mud Alley" as of 1985 had older bars and strip clubs. Mud Alley is located in an area which, in 1985, housed most of the African Americans in Richmond. As of 1993 many police raids for drugs occurred in "Mud Alley". "Mud Alley" was known by several other nicknames, including "Little Boomtown". Historically, the area had a lot of recreational drugs. There were 3,413 households out of which 39.6% had children under the age of 18 living with them, 53.6% were married couples living together, 16.4% had a female householder with no husband present, and 23.0% were non-families. 18.7% of all households were made up of individuals and 6.7% had someone living alone who was 65 years of age or older. The average household size was 3.16 and the average family size was 3.60. In the city, the population was spread out with 31.6% under the age of 18, 11.0% from 18 to 24, 28.5% from 25 to 44, 18.7% from 45 to 64, and 10.1% who were 65 years of age or older. The median age was 30 years. For every 100 females, there were 98.1 males. For every 100 females age 18 and over, there were 95.2 males. The median income for a household in the city was $34,888, and the median income for a family was $35,801. Males had a median income of $27,457 versus $22,723 for females. The per capita income for the city was $15,195. About 17.0% of families and 20.0% of the population were below the poverty line, including 30.4% of those under age 18 and 12.9% of those age 65 or over. The Texas Department of Criminal Justice operates the Jester State Prison Farm units, including the Jester I Unit, the Carol Vance Unit (formerly the Jester II Unit), the Jester III Unit, and the Jester IV Unit, in an unincorporated area 4 miles (6.4 km) east of Richmond. Fort Bend County Libraries operates the George Memorial Library, the central library and the site of the administrative offices of the library system, located along Farm to Market Road 762. Richmond also has the Fort Bend County Law Library. The Main Library moved from Rosenberg to its current location in Richmond in 1986. The George Foundation funded the 77,000 square feet (7,200 m2) library facility, designed by Ronald Wedemeyer Associates and built on 6 acres (2.4 ha) of land. When the library opened, it had unfinished areas to facilitate future expansion. 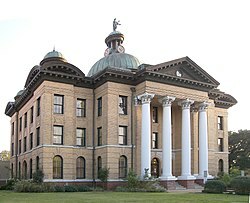 In December 1989 the Commissioners Court of Fort Bend County, in accordance with Texas Local Government code §323.021(a), ordered the construction of a law library. The main library expansion and the 1991 installation of an automation system used funds from the 1989 bond election, and expansion occurred on 1995 and 2002. The 2002 expansion included the addition of two conference rooms. The United States Postal Service Richmond Post Office is located at 5560 Farm to Market Road 1640. The city is governed by a mayor and two commissioners elected at large for two-year terms. The commission sets policy and the day-to-day management is done by a city manager hired by the commission. Hilmar G. Moore served as mayor from 1949 until his death on December 4, 2012 and was believed to be the longest-serving mayor in the United States. Richmond Police Department is in the old jail. William B. Travis building belongs to the county. The corporate city limits of Richmond is served by Lamar Consolidated Independent School District. Elementary schools within the Richmond city limits include Jane Long, Pink, and Smith. Wessendorff Middle School, Lamar Junior High School, and Lamar Consolidated High School serve the Richmond city limits. The three schools are in Rosenberg. Various schools operated by LCISD and neighboring Fort Bend Independent School District bear Richmond addresses, but do not serve the city of Richmond. George Ranch High School, Foster High School, Reading Junior High School, and Briscoe Junior High in LCISD and Travis High School and Bush High School in the Fort Bend Independent School District (FBISD) bear "Richmond, Texas" addresses. Fort Bend County Public Transportation provides local bus service in Richmond. ^ a b "Geographic Identifiers: 2010 Demographic Profile Data (G001): Richmond city, Texas". U.S. Census Bureau, American Factfinder. Retrieved August 30, 2016. ^ "Texas mulls defeat in battle of ideas, Kevin Connolly". BBC News. November 27, 2008. Retrieved January 5, 2010. ^ "60-year mayor running for re-election". KLTV. March 30, 2010. ^ a b c Kever, Jeannie. "Neighborhoods / Memories of home / Quiet pleasures are at hear of Richmond neighborhood." Houston Chronicle. Wednesday August 27, 2003. Houston 1. Retrieved on May 27, 2012. ^ a b Lopez, John P. "Meet a pair of true Friday night lights." Houston Chronicle. Tuesday October 10, 2006. Sports 1. Retrieved on May 27, 2012. ^ Muck, Patti. "Richmond probe over without comment." Houston Chronicle. Tuesday April 2, 1985. Section 1, Page 1. Retrieved on May 27, 2012. ^ Muck, Patti. "The grinches who stole . . . /Thieves take a big bite out of food pantry." Houston Chronicle. Saturday December 4, 1993. A38. Retrieved on May 27, 2012. ^ "Monthly Averages for Richmond, TX (77469)". Archived from the original on 2012-10-24. Retrieved July 12, 2013. ^ "Vance Unit Archived August 21, 2008, at the Wayback Machine." Texas Department of Criminal Justice. Retrieved on May 9, 2010. ^ Staff and Wire Reports. "Parts of Houston join evacuation." Houston Chronicle. September 21, 2005. Retrieved on May 10, 2010. ^ a b c "George Memorial Library." Fort Bend County Libraries. Retrieved on May 14, 2010. ^ a b "Fort Bend County Law Library." Fort Bend County Libraries. Retrieved on May 14, 2010. ^ "Post Office Location - RICHMOND." United States Postal Service. Retrieved on December 6, 2008. ^ Home." Jane Long Elementary School. Retrieved on December 27, 2016. "907 Main Str. Richmond, TX 77469 "
^ Home. Pink Elementary School. Retrieved on December 27, 2016. "1001 Collins Road Richmond, Texas 77469"
^ Home. Smith Elementary School. Retrieved on December 27, 2016. "2014 Lamar Drive Richmond, TX 77469 "
^ "Lamar C.I.S.D. High School Attendance Zones" ( Archived 2015-07-06 at WebCite). Lamar Consolidated Independent School District. Retrieved on July 6, 2015. ^ "2010 CENSUS - CENSUS BLOCK MAP (INDEX): Richmond city, TX" (Archived 2015-07-06 at WebCite). U.S. Census Bureau. Retrieved on July 6, 2015. Wikimedia Commons has media related to Richmond, Texas. This list includes items within or related to the City of Richmond as well as some areas outside of the Richmond city limits. Items within or related to areas outside of the city limits while having "Richmond, Texas" postal addresses are italicized. This list does not include places without "Richmond, Texas" postal addresses. The LCISD high school serving the Richmond city limits is Lamar Consolidated in Rosenberg. The italicized schools all have "Richmond, Texas" addresses but do not serve the city limits.